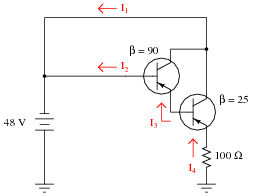 Solid-state switching circuits usually keep their constituent transistors in one of two modes: cutoff or saturation. Explain what each of these terms means. "Cutoff" refers to that condition where a transistor is not conducting any collector current (it is fully off). "Saturation" means that condition where a transistor is conducting maximum collector current (fully on). Follow-up question: is there such a thing as a state where a transistor operates somewhere between cutoff (fully off) and saturation (fully on)? 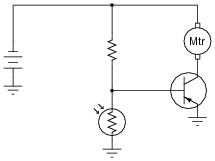 Would this state be useful in a switching circuit? In all fairness, not all transistor switching circuits operate between these two extreme states. Some types of switching circuits fall shy of true saturation in the ön" state, which allows transistors to switch back to the cutoff mode faster than if they had to switch back from a state of full saturation. 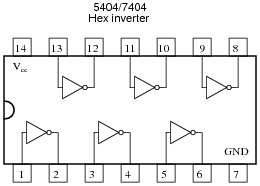 ECL (Emitter-Coupled Logic) digital circuits are an example of non-saturating switch circuit technology. Ask your students to explain what possible purpose such a circuit could perform. Trace the directions of all currents in this circuit, and determine which current is larger: the current through resistor R1 or the current through resistor R2, assuming equal resistor values. If switch SW2 were opened (and switch SW1 remained closed), what would happen to the currents through R1 and R2? If switch SW1 were opened (and switch SW2 remained closed), what would happen to the currents through R1 and R2? I'll let you determine the directions of all currents in this circuit! Although it is impossible to tell with absolute certainty, the current through R1 is likely to be much greater than the current through R2. If SW2 opens while SW1 remains closed, both currents will cease. If SW1 opens while SW2 remains closed, there will be no current through R1, but the current through R2 will actually increase. Follow-up question: what does this indicate about the nature of the two currents? Which current exerts control over the other through the transistor? The most important principle in this question is that of dependency: one of the transistor's currents needs the other in order to exist, but not visa-versa. I like to emphasize this relationship with the words controlling and controlled. An interesting point that some students may bring up is the 0.4 volt drop across the base-collector junction. 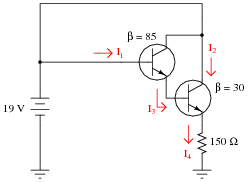 Attentive students will note that this junction is supposed to be reverse-biased, but Kirchhoff's Voltage Law clearly specifies the polarity of that 0.4 volt drop, and it is in the direction one would expect for forward biasing of that junction. An examination of the energy diagram for a conducting bipolar junction transistor is really necessary to explain why that junction is considered to be reverse-biased. 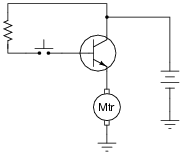 Correct the error(s) in this circuit, showing how it must be set up so that the transistor functions as intended. It is very important for your students to learn how the base current controls the collector current in a BJT, and how to use this knowledge to properly set up switching circuits. This is not difficult to learn, but it takes time and practice for many students to master. Be sure to spend adequate time discussing this concept (and circuit design techniques) so they all understand. The control circuit that usually sends pulse signals to the base of the power transistors is not shown in this diagram, for simplicity. Your task is to draw a pushbutton switch in this schematic diagram showing how the first motor coil could be manually energized and de-energized. Be sure to note the directions of currents through the transistor, so that your switch is installed correctly! Also, explain the purpose of the diode connected in parallel with the motor coil. Actually, there will be one of these diodes for each of the motor coils, but the other three are not shown for the sake of simplicity. The diode prevents damage to the transistor resulting from inductive "kickback" each time the motor coil is de-energized. 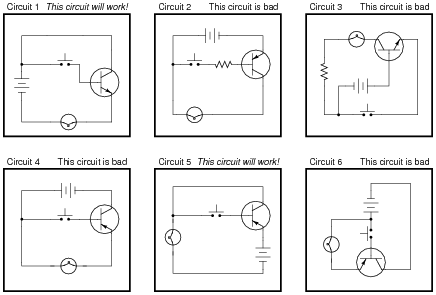 This is a very important concept for students to learn if they are to do any switch circuit design - a task not limited to engineers. Technicians often must piece together simple transistor switching circuits to accomplish specific tasks on the job, so it is important for them to be able to design switching circuits that will work. 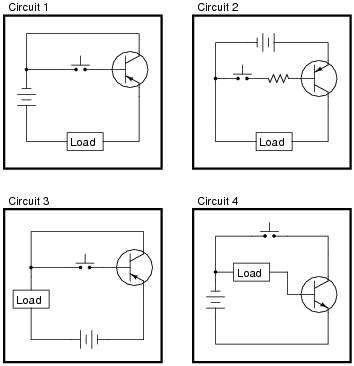 Have your students describe to the class how they were able to determine the status of each circuit, so that everyone may learn new ways of looking at this type of problem. Also have them describe what would have to be changed in the "bad" circuits to make them functional. 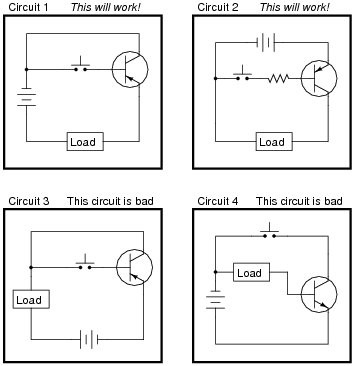 Follow-up question: circuit #3 is different from the other "bad" circuits. While the other bad circuits' lamps do not energize at all, the lamp in circuit #3 energizes weakly when the pushbutton switch is open (not actuated). Explain why. 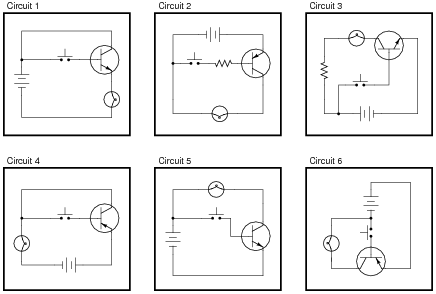 However, not all of these circuits are properly designed. Some of them will function perfectly, but others will function only once or twice before their transistors fail. Identify the faulty circuits, and explain why they are flawed. 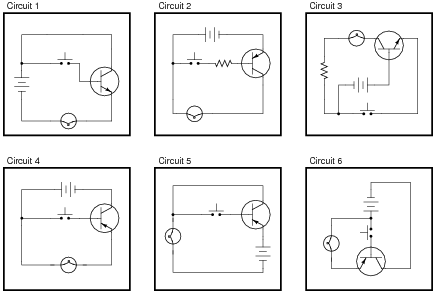 Circuits 3, 5, and 6 are flawed, because the emitter-base junctions of their transistors are overpowered every time the switch closes. Hint: draw the respective paths of switch and lamp current for each circuit! This is a very important concept for students to learn if they are to do any switch circuit design - a task not limited to engineers. Technicians often must piece together simple transistor switching circuits to accomplish specific tasks on the job, so it is important for them to be able to design switching circuits that will be reliable. A common mistake is to design a circuit so that the transistor receives full supply voltage across the emitter-base junction when ön," as three of the circuits in this question do. 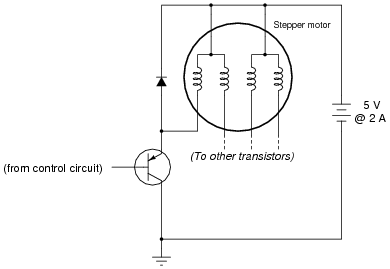 The result is sure destruction of the transistor if the supply voltage is substantial. Circuit #3 is a tricky one! The presence of a resistor might fool some students into thinking base current is limited (as is the case with circuit #2). Once students learn to identify the two current paths (base versus collector), especially the proper directions of current for each, the interconnections become much easier to determine. Some students may place the light bulb on the emitter terminal of the transistor, in a common-collector configuration. This is not recommended, since it places the light bulb in series with the controlling (base) current path, and this will have the effect of impeding base current, and therefore the controlled (light bulb) current. Given the very high electrical resistance of human skin, this circuit needs all the gain we can possibly muster! 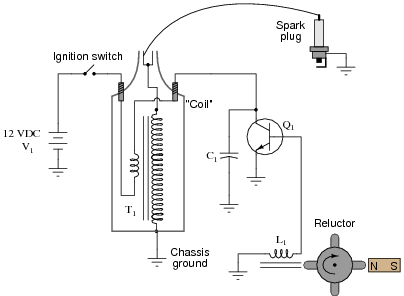 This circuit works well if an LED is substituted for the incandescent lamp. 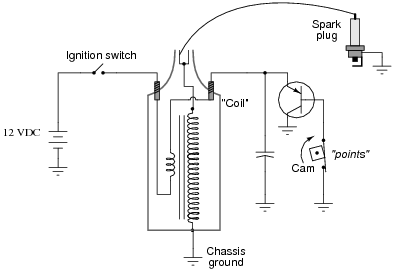 The cam-actuated "point" contacts open every time a spark is needed to ignite the air-fuel mixture in one of the engine's cylinders. Naturally, these contacts suffer a substantial amount of wear over time due to the amount of current they must make and break, and the frequency of their cycling. This device was seen by automotive engineers as a prime candidate for replacement with solid-state technology (i.e., a transistor). If a transistor could take the place of mechanical "point" contacts for making and breaking the ignition coil's current, it should result in increased service life. Follow-up question: assuming the primary winding of the "coil" has an inductance of 9 mH an a wire resistance of 0.4 W, determine the amount of time necessary to build to full current once the transistor or points have turned on (after 5 time constants' worth of time). Ask your students, "what is the purpose of the capacitor in this circuit?" Inform them that without it, the points would have "burned up" very quickly, and that the transistor will fail almost immediately! Some of your students familiar with engine ignition systems will notice that there is no distributor for multiple spark plugs. In other words, this circuit is for a single-cylinder engine! I chose not to draw a distributor in this schematic just to keep things simple. 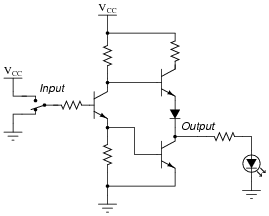 Explain how this circuit functions. Why do you think the triggering device is called a "reluctor"? What advantage(s) does this circuit have over a mechanical "point" operated ignition system? 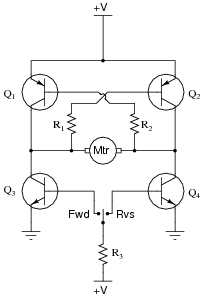 The "reluctor" generates pulses of current to the transistor's base to turn it on and off. The word "reluctor" is applied to this device in honor of a certain magnetic principle you should know! 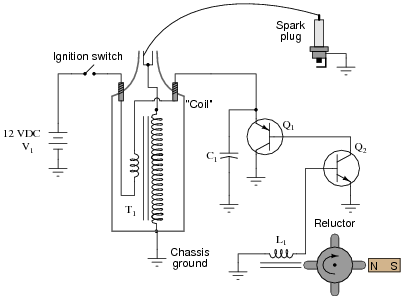 Discuss the advantages of a reluctor-triggered ignition system with your students. As far as I am aware, the system possesses no disadvantages when compared against mechanical point-driven systems. An interesting side note: one method of testing a reluctor-driven ignition system at high frequencies was to hold the tip of a soldering gun (not a soldering iron!) next to the pickup coil and pull the trigger. The strong magnetic field produced by the gun's high current (60 Hz AC) would trigger the ignition system to deliver 60 sparks per second. Transistor Q1 fails open (collector-to-emitter): No current through T1 primary or secondary, no high-voltage pulses across T1 secondary, full 12 volts (constant) across C1, voltage pulses still seen across L1, no spark at spark plug. Transistor Q1 fails shorted (collector-to-emitter): Constant current through T1 primary, no high-voltage pulses across T1 secondary, nearly 0 volts across C1, very weak voltage pulses across L1, no spark at spark plug. Reluctor magnet weakens: Smaller voltage pulses across L1, smaller current pulses through T1 primary, smaller voltage pulses across T2 secondary, weak or no spark at spark plug. Capacitor C1 fails shorted: Constant current through T1 primary, no high-voltage pulses across T1 secondary, nearly 0 volts across C1, normal voltage pulses across L1, no spark at spark plug. Capacitor C1 fails open: Excessive voltage pulses seen at Q1 collector (with respect to ground), very rapid failure of Q1. 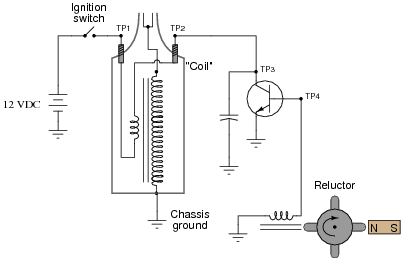 Transformer ("coil") T1 primary winding fails open: No current through T1 primary or secondary, no high-voltage pulses across T1 secondary, zero volts (constant) across C1, voltage pulses still seen across L1, no spark at spark plug. 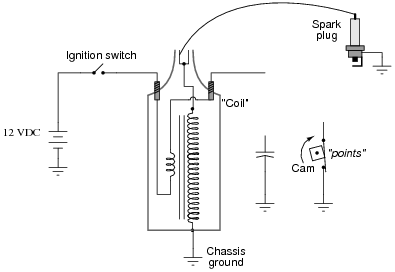 Transformer ("coil") T1 secondary winding fails open: All voltages and currents fairly normal except for no voltage across T1 secondary and no spark at spark plug, perhaps slightly greater voltage pulses seen at Q1 collector with respect to ground. Transistor Q2 fails open (collector-to-emitter): No current through T1 primary or secondary, no high-voltage pulses across T1 secondary, full 12 volts (constant) across C1, no current through any terminal of Q1, voltage pulses still seen across L1, no spark at spark plug. Transistor Q1 fails shorted (collector-to-emitter): Constant current through T1 primary, no high-voltage pulses across T1 secondary, nearly 0 volts across C1, voltage pulses still seen across L1, no spark at spark plug. Capacitor C1 fails open: Excessive voltage pulses seen at Q1 collector (with respect to ground), very rapid failure of Q1 and possibly Q2. Reluctor coil L1 fails open: No current through T1 primary or secondary, no high-voltage pulses across T1 secondary, full 12 volts (constant) across C1, full 12 volts (constant) across Q2 collector-to-emitter, no voltage pulses seen across L1, no spark at spark plug. Discuss with your students the meaning of the words ßourcing" and ßinking" in case they are not yet familiar with them. These are very common terms used in electronics (especially digital and power circuitry! ), and they make the most sense in the context of conventional flow current notation. In order for students to properly choose and place each transistor to make the circuits functional, they must understand how BJTs are triggered on (forward-biasing of the base-emitter junction) and also which directions the currents move through BJTs. 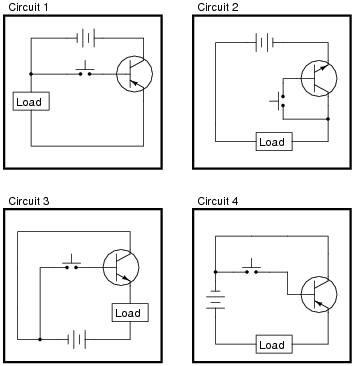 The two example circuits shown in this question are very realistic. Also, explain why resistors are necessary in both these circuits for the transistors to function without being damaged. The battery, and its connections to the rest of the circuit, are in good condition. Also, we know that the motor is not failed open. In all likelihood, the transistor is not being "told" to turn on. The very first thing you do is use your multimeter to check for source voltage, TP4 to ground. Between those points you find 24 volts DC, just as it should be. Next you measure voltage between TP2 and ground with the switch pressed and unpressed. With the switch pressed, there is no voltage between TP2 and ground, but there is voltage (about 23.5 volts) when the switch is unpressed. From this information, determine at least two possible failures in the circuit which could cause the lamp not to energize, and also account for the voltage measurements taken. Follow-up question: explain why we may say with confidence that there is no problem with the resistor or the switch. 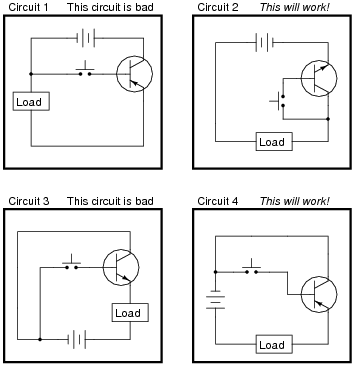 Discuss with your students how to reason from the empirical data to a set of possible faults in the circuit, and also how certain areas of the circuit (or individual components) may be safely eliminated from the list of possible faults. What is the significance of a transistor's beta (b) rating? What, exactly, does this figure mean? Explain how you might set up an experiment to calculate the beta of a given transistor. The "beta" rating of a transistor is a very important, yet very elusive parameter. Discuss the meaning of this specification with your students, and also their experimental setups for empirically determining beta. Then, compare the results of this discussion with the figures obtained from their datasheets. What do the datasheet figures indicate about the nature of beta as a parameter? After sharing the datasheet results, re-discuss the experimental setups for measuring beta. Would a single test be sufficient, or would it be advisable to test beta more than once for a given transistor? Explain what b means for a bipolar junction transistor, in your own words. I'll let you figure this one out for yourself! Many written definitions for b may be found in various textbooks and lexicons. What I am looking for here, as best as possible, is a definition cast in students' own words. What are some typical values for b? Is b always greater than 1 or less than 1? What does this suggest about the two transistor currents in the formula? What would the b value be for an ideal transistor? Ask your students to define "gain" as it applies to a transistor circuit. Ask them to explain why a Darlington pair has a greater current gain than a single transistor, and why that trait is important in a circuit such as this. Have your students come to the front of the class, either as individuals or as groups, and present problem-solving techniques for determining the unknown currents. Follow-up question: why would anyone want to use either a Darlington or Sziklai pair when a single transistor is able to switch current on its own? 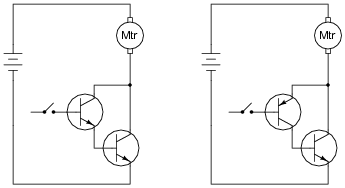 What advantage do either of these transistor pair configurations give over a single transistor? 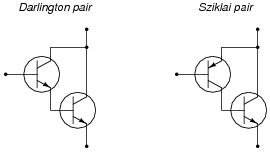 Sziklai pair circuits are often not discussed in electronics texts until the subject of audio power amplifiers, where the Sziklai pair is offered as an alternative to complementary power transistors in a push-pull circuit (where the final output transistors are both NPN instead of one being NPN and the other PNP). There is nothing wrong, however, with introducing the Sziklai pair configuration in the context of a simple switching circuit as it is done here. 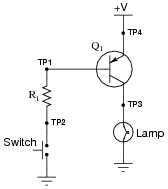 The switch exerts direct control over the lower transistor, which then indirectly turns on the upper transistor. 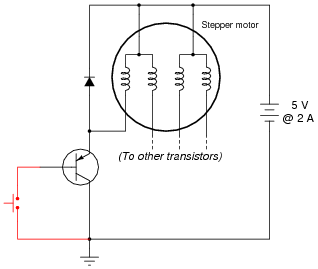 When both transistors are turned on, the motor runs. This question is really a precursor to analyzing the H-bridge motor drive circuit. Switch down, LED on; switch up, LED off. 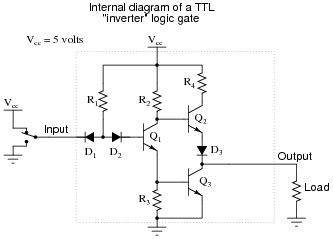 The circuit shown in this question is a partial TTL inverter gate. I opted to simplify the circuit (omitting the ßteering" diodes usually found at the input) for the sake of simplicity, so students could concentrate their attention on the two transistor stages following. Although this circuit may appear intimidating, it is not that difficult to trace currents and calculate voltage drops if one approaches it methodically. Being a digital logic circuit, it only ünderstands" two states: on and off. As you can see, a SPDT switch provides signal input into the logic gate, either full supply voltage (VCC) or no voltage at all (Gnd). 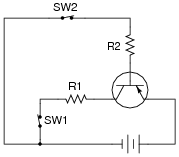 Determine the voltage across the load resistance for each of these switch states. Based on your analysis, what is the logical function of an ïnverter" gate? 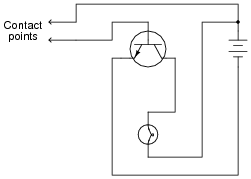 An ïnverter" gate simply reverses the logic state of the input. There is much to analyze in this circuit, and this question is not intended to be a full introduction to digital logic. It does, however, provide a preview of things to come, as well as an excellent opportunity to analyze diode and transistor circuitry in the simplest possible way: either fully ön" or fully öff". One tactic I have found useful as an instructor for analyzing complex circuits in front of a class is to project the image onto a whiteboard using a bright computer projector. Then, you may use dry-erase markers on the whiteboard to "comment" the diagram with voltage and current notations as you proceed to analyze the circuit with your students. Analyzing the circuit for a different logic state is easy: merely erase the "comments" made previously, and the schematic itself is unchanged, ready to be "marked up" again. There is a problem somewhere in this electronic ignition circuit. The "coil" does not output high voltage as it should when the reluctor spins. A mechanic already changed the coil and replaced it with a new one, but this did not fix the problem. You are then asked to look at the circuit to see if you can figure out what is wrong. Using your multimeter, you measure voltage between TP1 and ground (12 volts DC) and also between TP2 and ground (12 volts DC). These voltage readings do not change at all as the reluctor spins. 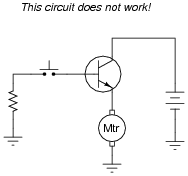 From this information, identify two possible faults that could account for the problem and all measured values in this circuit, and also identify two circuit elements that could not possibly be to blame (i.e. two things that you know must be functioning properly, no matter what else may be faulted). The circuit elements you identify as either possibly faulted or properly functioning can be wires, traces, and connections as well as components. Be as specific as you can in your answers, identifying both the circuit element and the type of fault. Note: the following answers are not exhaustive. There may be more circuit elements possibly at fault and more circuit elements known to be functioning properly! Ask your students to identify means by which they could confirm suspected circuit elements, by measuring something other than what has already been measured. You are then asked to look at the circuit to see if you can figure out what is wrong. Using your multimeter, you measure voltage between TP1 and ground (12 volts DC) and also between TP2 and ground (0 volts DC). These voltage readings do not change at all as the reluctor spins.